Manna Tritan Custom Water Bottle w/ Bluetooth Speaker - 28 oz. Take the party with you with this 28 oz. Manna Tritan Custom Water Bottle w/ Bluetooth Speaker! There is a Bluetooth speaker built into the lid that connects to both Android and iOS devices. CamelBak Chute Mag Custom Water Bottle - 25 oz. Featuring a leak-proof ergonomic high flow spout, this 25 oz. CamelBak Chute Mag Custom Water Bottle is ideal for taking to the gym, on a hike, or to the beach! The two finger magnetic carry handle keeps the cap stowed while drinking. Tritan Clean Sip Custom Water Bottle - 25 oz. Extremely durable, this 28 oz. Tritan Clean Sip Custom Water Bottle is great for use at the gym! It comes with a straw and drinking spout that stay closed when not in use so recipients can drink clean and germ free. CamelBak Stainless Steel Chute Mag Insulated Custom Water Bottle - 20 oz. Double walled and vacuum insulated, this 20 oz. 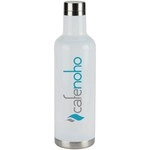 CamelBak Stainless Steel Chute Insulated Custom Water Bottle keeps beverages hot for 8 hours, and cold for 24 hours! It features durable powder coating, available in 3 trendy colors.